Thursday, December 6, Fort Worth, Tex. Kathleen Moore, Madill, Okla., Madalyn Colgrove, Boligee, Ala., and Cade Shepard, Summerdale, Ala. tied on Thursday with 218 points, the high score in the Non-Pro Semi-Finals, where 20 riders with 214 points or more advanced to Friday’s Non-Pro Finals. Cade Shepard on Barney Ross. Hart Photography. Cade Shepard, who turned 17 in November, won both the NCHA Super Stakes and NCHA Derby Non-Pro championships in 2015 on Twistful Thinking. The NCHA Non-Pro Hall of Fame earner of $690,937 scored 218 points on Thursday riding Barney Ross, by Bamacat. He also earned a qualifying score of 216 points on Chexy Louella, by Im Countin Checks. Lindy Ashlock, Abilene, Tex., was the only other rider to qualify with two horses, Very Reytro (216 points), by Dual Rey, and Desiresomeroyalty (215 points), by One Time Royalty. Kathleen Moore on Khaleesi Kat. Hart Photography. Kathleen Moore, the NCHA earner of $527,334, was a finalist in last year’s NCHA Derby Non-Pro (12th) on Princess Betty Rey, by One Time Royalty. This year, she is showing Khaleesi Kat, who Cody Green showed on November 28 in the Open Limited Finals. Khaleesi Kat, by Bet Hesa Cat, is out of the Kit Dual daughter KD Shorty ($227,987), a producer of money earners of $697,990, who was a finalist in the 2004 NCHA Futurity (6th) under Austin Shepard, Cade Shepard’s father. Moore purchased Khaleesi Kat for $80,000 in the 2017 NCHA Futurity Sales from Ten/27 Ranch. Madalyn Colgrove on Hammer Hughes. Hart Photography. Madalyn Colgrove, the NCHA earner of $572,635, was the 2017 NCHA Derby Non-Pro reserve champion on Sweet Baby Marie ($161,326), by High Brow CD, and also placed fourth on Peptos Turn To Dual, by Dual Rey. Hammer Hughes, by Thomas E Hughes, her 2018 NCHA Futurity Non-Pro mount, is out of the Dual Pep daughter Aint Got No Cents, a full sister to June Bug Dually ($222,860), who tied for third in the 2007 NCHA Futurity Open Finals under Darren Simpkins. 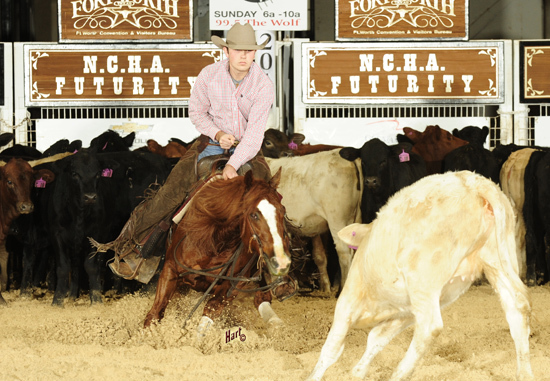 It is interesting to note that the three top Non-Pro Semi-Finalists all have ties to Austin Shepard, winner of the 2007 NCHA Open Futurity on High Brow CD, as well as winner of the 2017 NCHA Futurity on Dual Reyish, including the fact that Shepard rode the sires of the horses shown by the three finalists, Thomas E Hughes ($393,045), Bamacat ($351,360), and Bet Hesa Cat ($267,465).